Made everything here from scratch including the cheese. 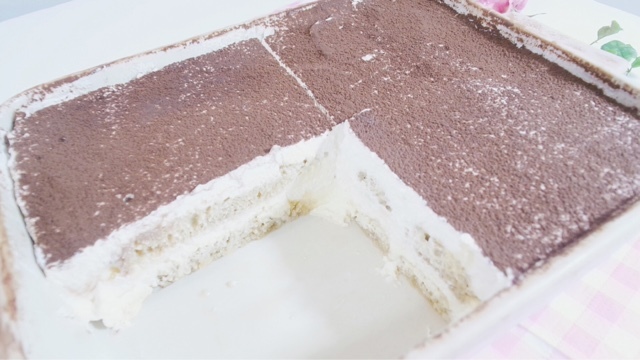 Mascarpone is surprisingly very easy to make from home with only two ingredients. 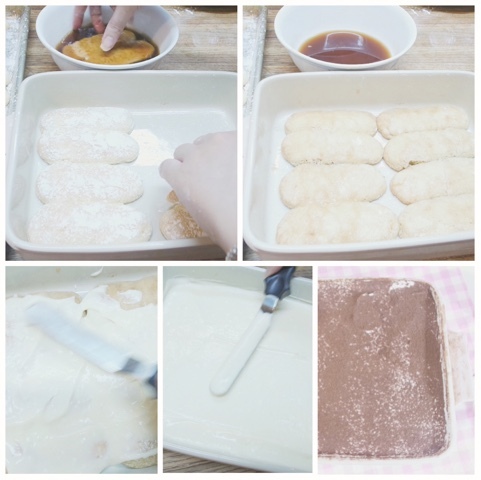 Ladyfingers just have very basic ingredients from home and bake very beautifully. I suggest making this recipe A few days ahead starting with the mascarpone so it can firm overnight. And the cake should be chilled for 48 hours in advance for the flavors to come together. 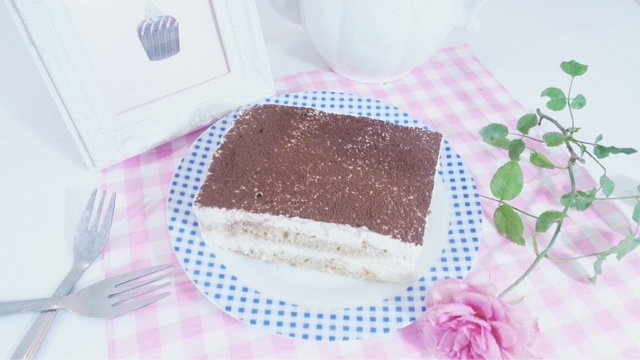 You could also just buy ladyfingers from the store and mascarpone from the grocery store to make this more quick. But I still recommend chilling the cake for 48 hours at least. This recipe has a strong coffee taste, so if you don't like coffee, I suggest not making this cake since we're drenching this thing in coffee. You can also add some rum (2 tablespoons) into the coffee, but for my personal preferences I omitted alcohol. On low heat, heat 2 cups of heavy cream in a pot, once it reaches 180F keep it at that temperature for 3 minutes, add in 1 tablespoon of lime juice stir continuously and keep the temperature at 180F for three more minutes. Remove it from the heat, let it cool down completely for 1 hour. 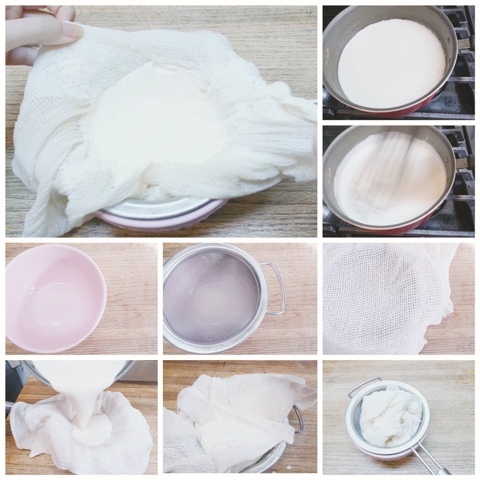 Get a bowl, strainer with cheese cloth folded at least 2-3 layers over it. Pour the liquids into the cheesecloth. Cover with cheese cloth and place it in the fridge until it thickens the next morning. Throw out the extra liquids that strained out from the bottom. Note: This recipe is supposed to make 1 lb of mascarpone cheese but it ended up only making half of that for me. 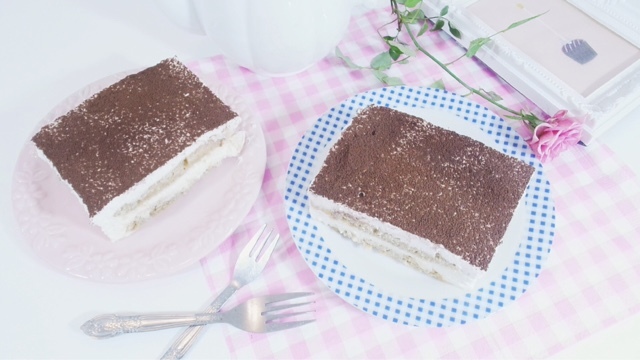 If yours end up making 1 lb, you can adjust the Tiramisu recipe to double the mascarpone filling and a little over half the whipped cream filling if you'd like to use up all the mascarpone at one go. You can also just buy mascarpone from the grocery store. Using a Kitchen Aid mixer's smaller bowl, with the whisk attachment on medium speed, whip up egg whites until foam. Slowly sprinkle in 2 two tablespoons of the sugar. Continue whipping until stiff peaks. This may take 10 minutes. The egg whites will be white and glossy, what you call a meringue. 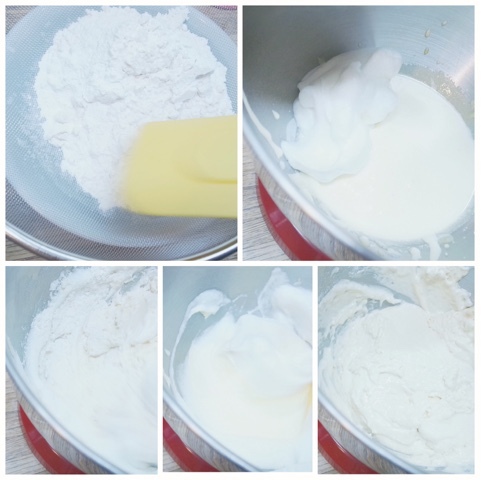 To test for stiff peaks: Stop the mixer and remove the whisk attachment, quickly whisk by hand and lift, point the tip of the meringue and wobble it a little, if the tip doesn't shake, its stiff peaks. 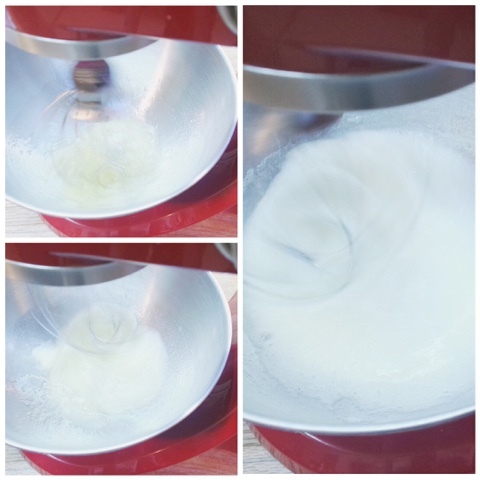 If you failed this step, look below on "99 Reasons Why My Meringue Did Not Achieve Stiff Peaks"
In another mixer bowl whip together 4 yolks using a whisk attachment. Egg yolks are a bit more forgiving that egg whites are so you can gradually add in the remaining sugar. Just whip these until they're pale in color. On a half sheet pan line it with Silpat mat or parchment paper. 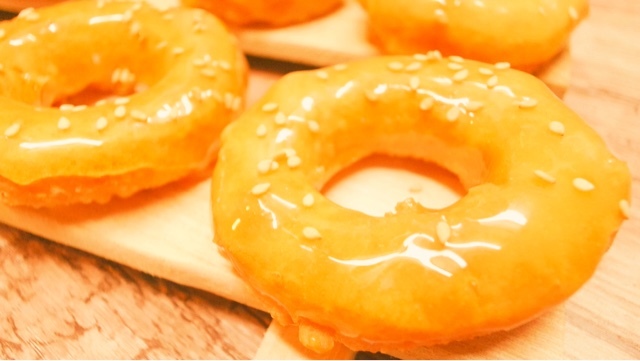 Using a 1A piping tip (large circle tip), large piping bag. 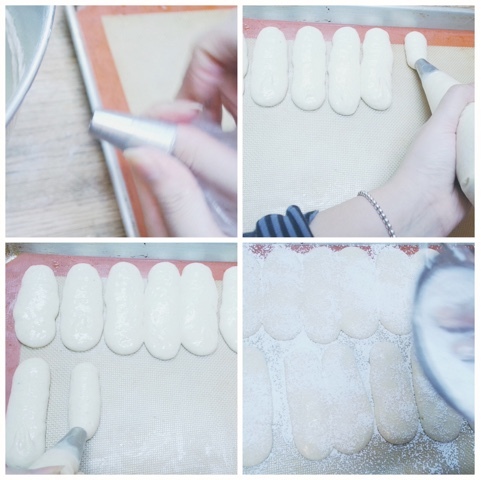 Fill the bag with the ladyfinger batter and pipe out lines of ladyfingers flick the bottom ends towards the front. Make these a little skinny because these spread A LOT. You can always just test it out by piping one line and seeing how much they spread. leaving 1/2 inch in between pipe out more rows of lady fingers. You can always cut and adjust the size of the ladyfingers once they're baked and cooled, but try to bake them around 3 inches long. Sift powdered sugar over piped lady fingers. 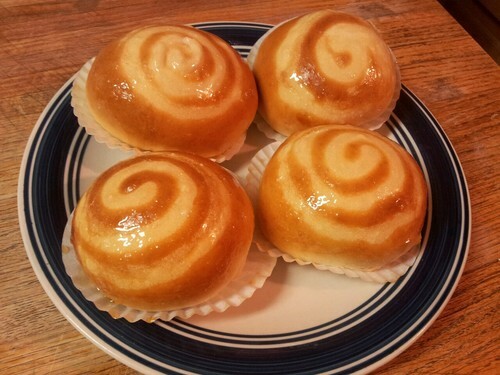 Bake at 400F in a preheated oven for 8 minutes or until you see the edges lightly golden. Cool completely, flipping over the Silpat mat/parchment paper gently (with the lady fingers still attached) slowly peel off the Silpat mat/parchment paper from the ladyfingers. In a pot in whisk together the yolks with sugar. Cook on medium heat stirring in the milk, stirring continuously until it boils. Boil for 1 minutes, and remove from heat, let it cool, cover and chill in fridge for an hour. In a mixer with a whisk attachment blend together 2 cups of cold heavy cream with 1 teaspoon of vanilla until stuff. Whisk together mascarpone cheese with egg yolk mix. Make with 1 teaspoon of Folgers Instant Coffee Granules and 6oz of hot water, or just make a little under 1 cup of coffee. Cool the coffee. Lightly dip the cooled lady fingers on both sides and line them on the bottom of a 7 x 11 inch dish. 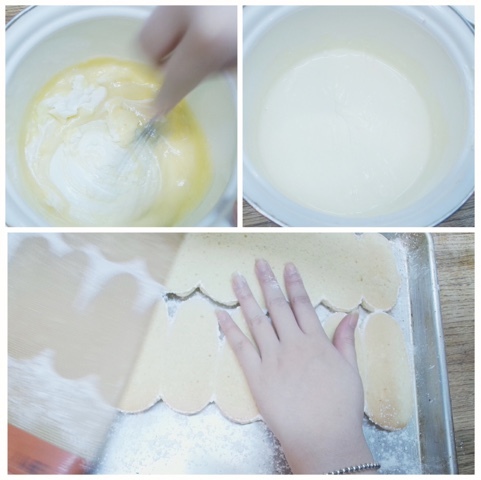 (You can either dip the lady fingers or brush on the coffee with a pastry brush) Don't be afraid to peel ladyfingers apart to make them fit into the pan. 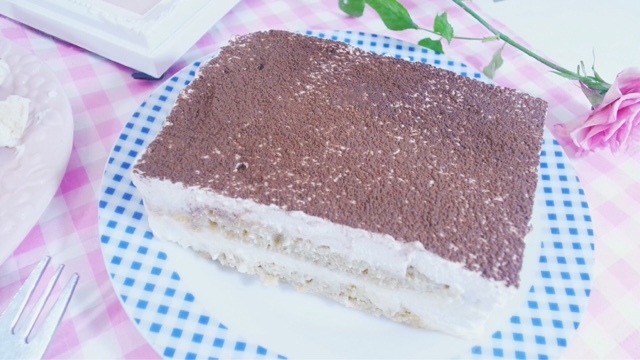 Spread half the mascarpone mix over the ladyfingers evenly, and spread over half the whipped cream Repeat this layers again and sift cocoa powder over it. Cover and refrigerate for 48 hours for the flavors to come together. Minimum refrigeration time: 4 hours. 99 Reasons Why My Meringue Did Not Achieve "Stiff Peaks"
Egg yolks and egg whites weren't separated properly, egg yolks/fat/dirt in the egg whites will taint the whites and make them unable to whip up. Carefully separate the egg yolks/white by hand, and if you see any yolks you may be able to save it by spoon it out. Tools, whisks, the bowl must be completely clean and dry too. Starting on too high of a speed can make the cake collapse later. You want this to be a gradual process, gradually building. Starting from a low or medium speed and slowly increase it by increments of 1. In some cases the amount of egg whites you're using is too little, and your bowl is too big, starting on a medium high speed is better. Dumping all of the sugar at once. You're basically just drowning it in the sugar, we need to sprinkle it in and let it slowly absorb the egg whites. Giving up too soon. Wait a little 10-12 minutes before throwing out your egg whites and starting over. It takes a while for meringues to form. The time it takes it really depends on your egg whites and a lot of factors that I can't really give you a X amount of time until its done. In a pot in whisk together the yolks with sugar. Cook on medium heat stirring in the milk, stirring continuously until it boils. Boil for 1 minutes, and remove from heat, let it cool, cover and chill in fridge for an hour. *Photo not shown for whipped cream* In a mixer with a whisk attachment blend together 2 cups of cold heavy cream with 1 teaspoon of vanilla until stuff. 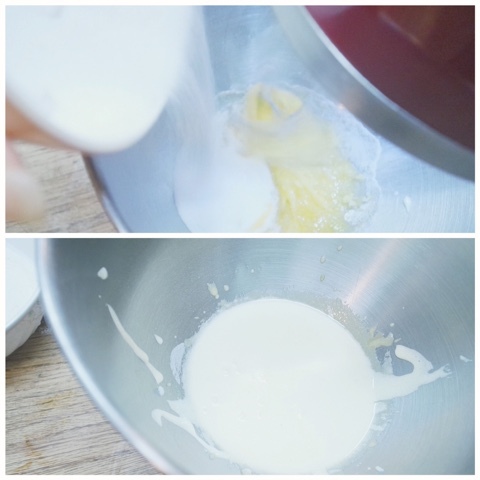 Using a Kitchen Aid mixer's smaller bowl, with the whisk attachment on medium speed, whip up egg whites until foam. Slowly sprinkle in 2 two tablespoons of the sugar. Continue whipping until stiff peaks. This may take 10 minutes. The egg whites will be white and glossy, what you call a meringue. 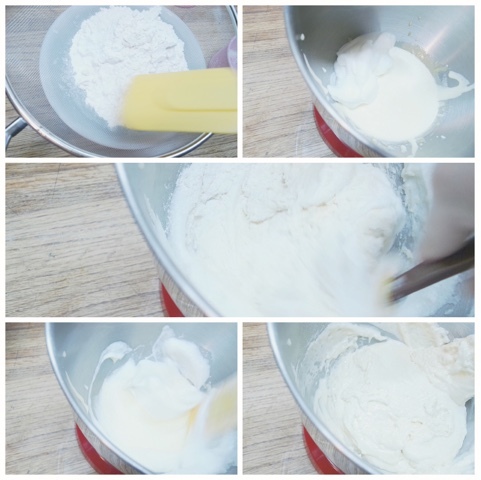 To test for stiff peaks: Stop the mixer and remove the whisk attachment, quickly whisk by hand and lift, point the tip of the meringue and wobble it a little, if the tip doesn't shake, its stiff peaks. If you failed this step, look at "99 Reasons Why My Meringue Did Not Achieve Stiff Peaks"
Cool completely, flipping over the Silpat mat/parchment paper gently (with the lady fingers still attached) slowly peel off the Silpat mat/parchment paper from the ladyfingers. 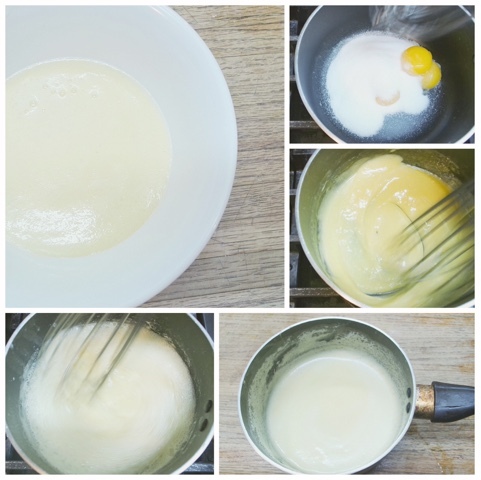 Whisk together mascarpone cheese with egg yolk mix.